At 3PL Center, we are a one-stop shop for premium pick and pack services. our pick and pack solutions are designed to make your business more efficient, and ensure your goods are shipped to B2B or B2C markets in a timely, safe and most cost-effective way. When it comes to your warehousing fulfillment needs, our pick and pack services offer a broad range of advantages. For example, you can fulfill, pack, and store your orders all through a single, warehouse or using all of our warehouses. 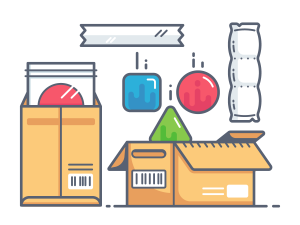 Pick and Pack is a type of service usually offered by fulfillment centers. It is recognized as a process of gathering individual components of an order, such as from master cartons. This part is called picking. We then take the individual items and pack into one or more boxes/mailers. This typically saves space, materials and cost on shipping. We use heat sealed tape to close our boxes, which ensures the boxes will not open during transit. We have air pillow machines to make air pillows to keep the products safe. We ensure our shipments look professional, and will avoid breakage which protects your overall bottom line and waste of time on damage and claims. We also provide a comprehensive in depth look at your product to make sure it’s shipped the best possible way and we’ll notify you about issues with your packaging. We will also make recommendations on how to fix or make the fixes for you. Why Should You Choose 3PL Center for Pick and Pack? Since our inception, we have been providing world-class third-party logistics services to businesses, pick and pack solutions included. With more than 45 years of combined experience, we are experts in managing premium-level warehousing facilities. Our experienced warehouse employees are trained to operate and handle the most current warehouse equipment. That’s why we can facilitate a stellar supply and distribution chain for your business. 3PL Center continually strives to provide you with a reliable turnkey distribution system to meet your picking and packing needs. We offer prompt pick-up and delivery service as well as detailed documentation that track your shipment from start to finish. What’s more, we are using computerized inventory and shipping systems. This has enabled us to provide web integration for your operations. When you work with 3PL Center for your pick and pack needs, you have peace of mind knowing that our customer service team is available 24/7. Whether you run an ecommerce site or are a small-sized wholesaler to a Fortune 500 manufacturer, you can rest assured that we serve all our clients with unmatched passion and dedication for your pick and pack needs. Ready to Get Started with Pick and Pack? To find out more on how you can leverage on our pick and pack capabilities, don’t hesitate to contact us via email at sales@3plcenter.com or phone call at 732-391-2500.